I hope that when you saw the title for this message, you thought of the 2007 film of the same name, starring Jack Nicholson and Morgan Freeman. Did you see that picture? 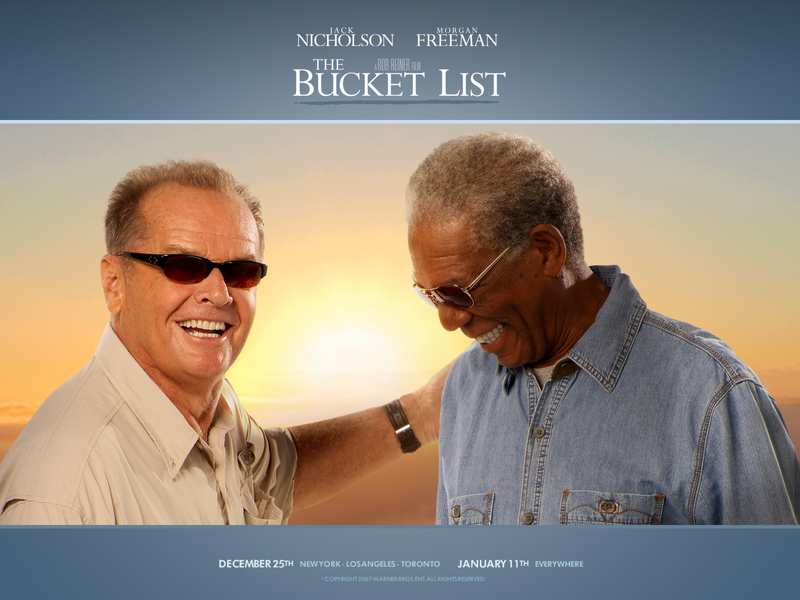 It features two dissimilar characters, each of whom is dying of cancer, who set out on a quest to accomplish a number of life goals before their time on earth is finished. 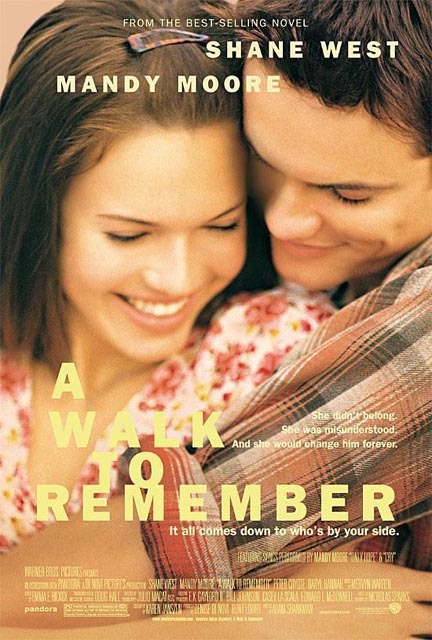 If you didn’t see that one, maybe you’re familiar with the 2002 film called A Walk to Remember, in which a young man becomes a better person as he helps his girlfriend fulfill her dying wishes. Each of these films did pretty well at the box office – they were in the top five when they opened. They are good movies, but they are fundamentally flawed stories, at least for most of us. Most of us have, at some level, the foggy realization that the clock is ticking and that we are living on borrowed time. But most of us do not have some significant crisis that forces us to so prioritize our days and our energy with the kind of urgency that we see in The Bucket List or A Walk to Remember. If you knew that you were going to die in six weeks, would that affect the way that you spent your time today? Probably. The question for us is this: how do we create a sense of urgency, or at least a sense of appropriate priorities, when we don’t know the script for the next six or twelve months? Without knowing exactly how much time is left, who do we want to be? It’s a question of vision, isn’t it? For the last three weeks, each of us has received a card asking an important question. This week, you should have received one that invited you to name some of the things that you’d like to see happen here at the Crafton Heights church in the next twelve months. Did you think about what God is longing to bring forth in this place? What about in your own personal life? Is there any place where your vision for your personal life overlaps with your vision for the church? How can we fuel CHUP with what excites you? How can you get fed, motivated, or inspired by what happens here? Our scripture this morning consists of three very brief passages. In Joel, we heard about a God whose spirit falls on all kinds of people. Isn’t that a sign of the church? That we are called to demonstrate God’s big dreams – whether we are young or old, rich or poor? The passage from Colossians is a reminder to make sure that we are focused on God’s purposes in our lives – and the way that we do that is by continuing to put ourselves where God can get to us. I was thinking about this passage as I drove the PA Turnpike earlier this week. I was listening to the radio, but was frustrated when I drove through the tunnels and lost my program. Then it occurred to me that there are lots of times when I think that God’s been silent in my life, only to realize that I’ve been hiding out somewhere underground – focused on things that are not important, or that would draw me away from God’s best for my life – and when I’m able to crawl out from those things, I see that I’m in a much better position to get the message that God has for me. The passage from Matthew is a familiar reminder to place God first in our lives – and when we do so, we can see how all our needs fall into place once the priorities are set. With this in mind, then, I’d like to share a few thoughts as to my own vision for the Crafton Heights church in the year to come. I can’t stand here and tell you that we’re going to close the church if we don’t do this, or that I have some terrible disease and want to guilt you into something. Nope. All I can say is that I have a vision for this community. Simply put, that vision is that our congregation can be a place where people know Jesus. As I state that vision, I need to confess that there has been some evolution in my own thinking over the past couple of decades regarding what it means to know Jesus. Early in my life, I thought that it was important for folks to “know Jesus” because people who didn’t would end up rotting in hell for eternity. My faith in Jesus was essentially a “fire insurance” policy – I was not particularly interested in the eternal lake of fire (and still am not, by the way), and if praying the “sinner’s prayer” would get me out of that, well, then, I was all for it. 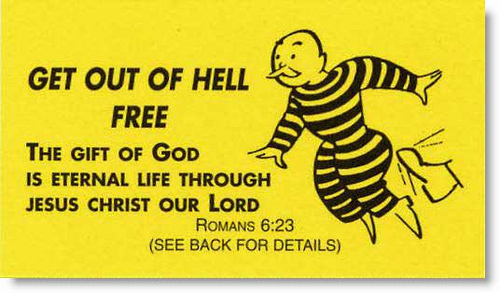 In fact, there was a time when I even carried around little cards inviting people to “get out of Hell free” by knowing Jesus. I used to leave them with a tip at restaurants. I never, ever, had any notion that this profound act of generosity on my part ever induced anyone to go to church or believe in Jesus, but it made me feel holy. Then, someone gave me a real tip: instead of leaving a mini-sermon on the table, why not leave money so the underpaid waitress could feed her kids? I don’t want to sell the importance of knowing Jesus as the Lord of your life short, but I do need to say that I came to understand that the point of the incarnation was not merely to save my bacon for eternity. There was something deeper. At that stage, “knowing Jesus” became a matter of trying to learn more about Jesus. What was important to him? Who was he and what did he teach and why? As I think about Crafton Heights as a place where Jesus is known, there is a strong emphasis on this aspect of our discipleship. How can I say that I “know Jesus” unless I am willing to learn about the things that matter to him? Faithbuilders, Youth Group, and small group Bible studies are places where we can learn what the Bible says about things like justice, sin, life, and hope. But knowing Jesus is more than an intellectual pursuit. Doesn’t it also mean that we’ve got to look for Christ in the world? Knowing Jesus is not only memorizing the beatitudes or knowing all the miracles in the Bible. It’s more than that – it’s not only learning the things that are important to Christ, but looking to participate in them in some great way. Here, we can do that through the a-MAIZE-ing Grace famine relief, or the food bank offering. Many of you have told me how you have found a deeper appreciation for who Christ is by pointing to his work in the world as you have participated in pro-life causes or walked for peace or sat with the dying. To be sure, “knowing Jesus” around here means pointing to Christ’s work in the world. But by God’s grace, that’s what’s supposed to happen every day. The Tuesday morning craft group, or the Preschool, or the Open Door – each of these places are laboratories where someone can come in off the street and see you…but more than that, they can see Jesus. They can see what happens when someone is willing to risk being faithful with his or her life – even when you’re not going to die next Thursday or the world isn’t going to end on December 21. My vision for our faith community in the next 12 months is simply this – that we might be a place and a people where Jesus is known. Not merely in an intellectual sense (although I hope we are growing in wisdom). Not merely in a programmatic sense (although I expect that we will be busy). But that we might be a people and a place where the life and heart of God as revealed in Jesus of Nazareth is palpable and tangible. Many of us have spent three weeks in a series of discussions that have led us to consider more deeply the ways in which we can align our behavior with God’s priorities. We’ve used those cards to which I alluded earlier. And now this week, we’ll be sending out our “estimate of giving” cards for 2013. Each of you will have an opportunity to give prayerful thought to planning the financial gifts you intend to make through this congregation in the year to come. Why do we do this? Because the ways that we spend our money and our time provide us with the clearest reflection of the priorities that we have in life. In the movies I mentioned earlier, the characters all decided that they wanted to use their resources of time and money in specific ways because they knew that they would not last forever. You and I vote with our wallets and our calendars every day, and I’ve found that if I plan ahead, I do better at reflecting God’s wisdom and priorities. One of the most important decisions I’ve made was the day in 1981 when I decided to sponsor a child through World Vision. I was a student, paying my way through college. I had a lot of bills, and I was anticipating a wedding. And this was going to cost me $17/month – about 10% of my income at the time. But I signed up, and it made a fantastic impact on my life. I discovered that I could do it. I was able to be happy with less because I was more aware of the needs of others. That $17/month taught me as much as the education for which I was charged a lot more! The discipline of giving taught me to be content – and that’s made such a huge difference. Joseph Heller, the author of the great American novel Catch-22 was at a dinner party with fellow author Kurt Vonnegut in the home of a billionaire financier. Vonnegut pointed out to him that their host made more money in a single day of hedge fund trading than Heller would ever earn in his writing. Heller replied, “Yes, but I have something that he will never have.” Vonnegut pressed and said, “What on earth could that be, Joe?” Heller said simply, “The knowledge that I have enough.” Think about that the next time you read about a person being trampled to death at a shopping mall on Black Friday. Enough. By the grace of God, I have enough. By the grace of God, I am blessed to give more than $17/month these days. In fact, God took that little seed and planted it so that this year, Sharon and I were able to make more than 20% of our income available for the Lord’s work. I’m not saying that to impress you. Heck, you know me. I’m not saying that to impress God. Heck, God doesn’t need my money to pay God’s bills. I’m saying that because in the space of a few short years – years when I was not dying of cancer or hurtling towards the apocalypse – I have learned that this is a way that I can align my life with God’s priorities. When you receive your Estimate of Giving card this week, my deep hope is that you will prayerfully consider how you can be God’s agent in this time and place – and how together, we can know Christ in the months that lie ahead – and that in our knowing Christ, that those around us will be blessed by the hope and joy that comes from Christ’s presence in the world. This was in the Pittsburgh Post-Gazette on Thanksgiving Day 2012. It’s some helpful publicity if it raises some money for a great cause. I’m delighted for all the folks who are working hard on this! As the Rev. David Carver says grace over his family’s Thanksgiving meal, he will also ask God to bless his church’s efforts to save some of the 2 million Malawians facing famine in 2013. The vision of emaciated, dying children is never far from his thoughts. Rev. Carver, pastor of First United Presbyterian Church of Crafton Heights, wants to pay forward what Indians in Massachusetts did for his ancestors who faced starvation. He traces his heritage to the Pilgrim Carvers, whose most prominent figure, John Carver, was the first governor of the Mayflower Pilgrims. According to early accounts, two Indians in 1621 taught the starving Pilgrims how to grow maize. Maize is also the staple food of Malawi, a central African nation that is among the world’s poorest. Rev. Carver is so involved in Pittsburgh Presbytery’s 20-year Malawi partnership that Malawi President Joyce Banda personally asked him to organize a church-based relief effort before starvation sets in. The resulting “A-MAIZE-ing Grace Famine Relief” can turn $25 into enough maize to feed an average Malawian family for a month. About 90 percent of Malawians earn less than $2 per day. They grow crops in large gardens and live for a year on what they harvest in late spring. “March is the hungry season because what you harvested last year is almost gone, and what you planted for this year isn’t ready yet,” Rev. Carver said. About every 10 years, the weather, public policy or both produce severe famine. The last was in 2001, when Rev. Carver was chairman of Pittsburgh Presbytery’s Malawi Partnership. Top leaders of the Presbyterian Church in Malawi made a desperate plea to Pittsburgh Presbytery, saying that starving people were coming to their churches. 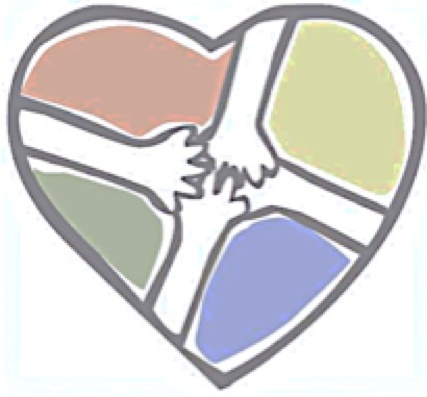 Pittsburgh Presbytery made an immediate gift of $20,000 and ultimately launched a national appeal through the Presbyterian Church (USA). It raised money, but it took a year to receive approval through church channels while tens of thousands of Malawians died. In 2003, the Presbyterian Church (USA) asked him to take a group of philanthropists to Malawi to see how the donated money saved lives. They stopped at a church where he had preached as an exchange pastor in 1998 and had baptized many babies. An elderly woman holding a nearly skeletal little girl approached him and began pounding on his chest, crying out in a local language. On the same trip, a young pastor, the Rev. Dennis Mulele, told him, “Dave, six months ago, I was doing eight or nine or 10 funerals a week, every week. I had so many funerals, and so many were for children. Now, since this food has started to come, I am only doing two or three funerals a week, and many of them are for old people,” Rev. Carver recalled. More recently, Rev. Carver has worked on clean water and river transportation projects for Malawi. He thought that was what Malawi’s president wanted to discuss when an influential Malawian told him to ask for an appointment when Ms. Banda visited New York in September. Ms. Banda, a businesswoman, philanthropist and politician, unexpectedly became leader of her nation in April after her notoriously corrupt predecessor, Bingu wa Mutharika, died in office. He had alienated many nations that were major suppliers of humanitarian aid. She has earned a reputation for honest government, slashing her own salary by 30 percent. Her opponents’ biggest criticism is that she is personally overseeing distribution of maize to the poor. Her critics see that as political, her supporters as necessary to prevent theft. Ms. Banda is also an active Presbyterian. “The first thing she did was sit down and, when I started to introduce myself, she said, ‘Do you think you could pray with me first, before we start to talk?’ So I prayed,” Rev. Carver said. The 15-minute meeting turned into an hour. Instead of water projects, she wanted to discuss famine relief, saying she knew of his work a decade ago. More than 2 million of the 14 million Malawians are in danger of starvation, he said. Since the nation’s median age is about 17, many will be children. By coincidence, the general secretary of the Malawi synod of the Presbyterian Church of Central Africa was staying at Rev. Carver’s home at that time. Together they drafted a plan. It calls for a $25 donation to buy a 100-pound sack of maize, which can feed an average Malawian family for a month. The two pastors sketched a design for a small pillow resembling a bag of maize, and Rev. Carver recruited volunteers to sew them. Donors will receive a pillow to give to a loved one with a note saying that maize has been given to Malawians in the person’s name. “The food will be distributed free of charge to anyone who has need, not only to Presbyterians, not only to Christians,” Rev. Carver said. The head of the Malawian church insisted that better-off Malawians should contribute 10 percent of the cash. Rev. Carver has put the plan on the web so that any church or civic group can get involved. It’s available at www.malawipartnership.org. Checks made payable to “Pittsburgh Presbytery” with “famine” in the memo line can be sent to the presbytery at 901 Allegheny Ave., Pittsburgh, PA 15233. When Rev. Carver pitched A-MAIZE-ing Grace at last month’s presbytery meeting, “We gave out every pillow that I had, which was 140. I could have given out 400 if I’d had them,” he said. Donations poured into the presbytery, the largest was $5,000 from one individual. Rev. Carver has 15 seamstresses working on pillows. Rev. Carver said that the Malawians have taught him what it means to give thanks to God. They take nothing for granted and don’t assume that their hard work is solely responsible for their survival. They have seen too many hardworking people die prematurely, he said. “When we pray, ‘Give us this day our daily bread,’ it’s a prayer we [Americans] don’t really believe because we stockpile like crazy. But the folks I know who have lived closer to life’s edge often have a far greater appreciation for that daily bread,” he said. Ann Rodgers: arodgers@post-gazette or 412-263-1416. November…it’s Stewardship Season at Crafton Heights. This year, instead of the traditional “Sermon on the Amount”, we are pursuing a church-wide time of reflection and study called Extravagant Generosity. This four week program includes small group reflections, individual devotions, and suggested sermon themes. This message was preached on November 18, 2012 and was anchored in Deuteronomy 6:4-9 and John 13:34-35. No? Yeah, I thought I was reaching there. 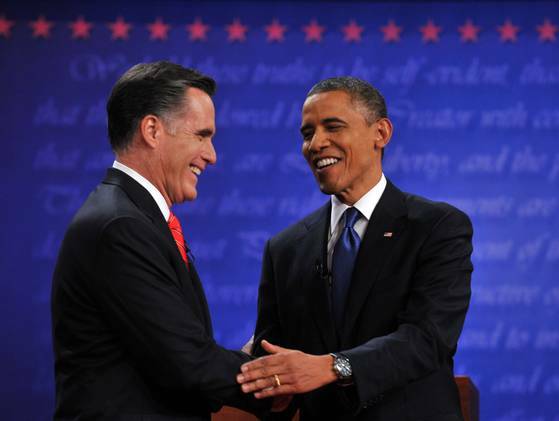 Have you talked with anyone who was longing for more attack ads, bigger budgets for the PACs, and a longer campaign season? It’s hard to believe that anyone would be missing those things, isn’t it? Now, compare that to the things you said about CHUP last week when I asked you, “What do you love about our church?” The cards you returned are posted in the back of the room, but when I asked you in worship to name a few, you mentioned the welcome you’d received, or the grace or friendship that was extended to you. It’s important to point out, I think, that when I asked, “What do you love about our church?” nobody said, “We are all so like-minded and agree on everything!” That’s because we don’t. But somehow, we have managed to build here a place of safety and of love – we have a set of relationships that are not based on politics, theological interpretations, or other ideologies. We are striving to know and love each other as God in Christ has known and loved us. That’s what we see here, and that’s what we’ve heard in the readings from Scripture for today – that the core of the Gospel is a relationship. Our first relationship is with God – the God who created us, loved us, and moved toward us in the person of Jesus of Nazareth. We know and are known by a God who has become one of us. Isn’t that the truth? But, as they say on your favorite commercial: “Wait, there’s more!” God gave us to each other. 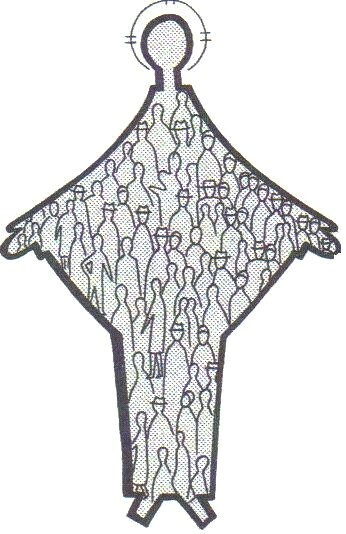 Isn’t that the heart of the Old Testament – that in spite of what you might have heard in some church somewhere, God did not choose to call an assortment of individuals who would each have merely “a personal relationship with Jesus Christ…” God called a people to himself. God, who exists in the relationship that we call the Trinity of Father, Son, and Holy Spirit, relates to us as, well, us. And he told us to love each other. The Old Testament lesson for today is called the Shema Yisrael, and it is at the heart of the Torah – the first set of writings we have in the scriptures. In it, we are called to love God, and in the verses that we heard today, we understand that we are to nurture that love for God in our families, amongst our children, and with our neighbors. 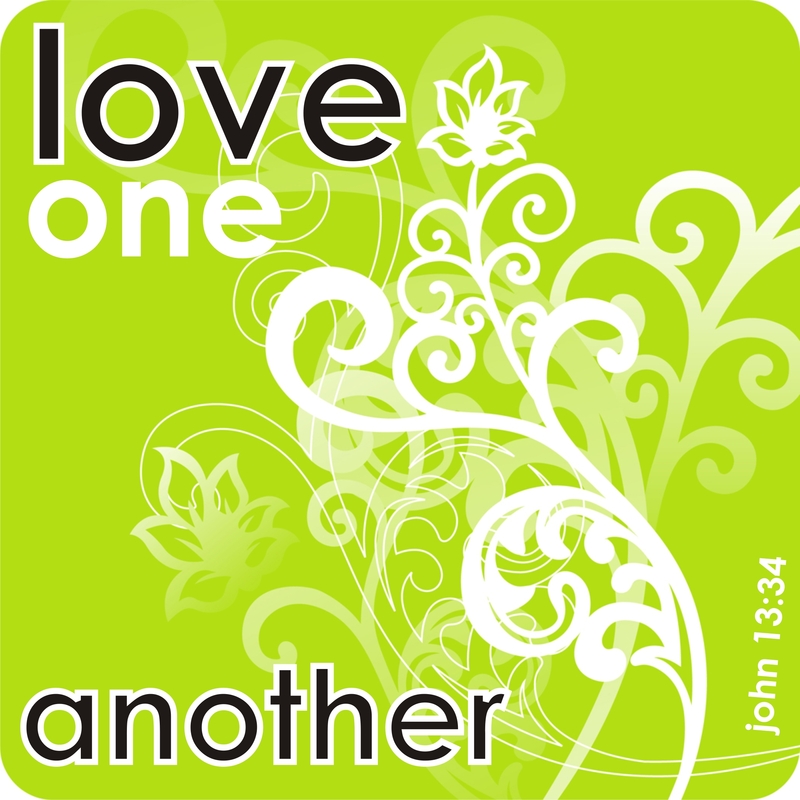 The New Testament lesson amplifies that call to love God and ties it directly with our ability to love one another. As we look at the Shema Yisrael through the lens of Jesus, we see that our love for God becomes evident to others when we care for the people who are around us. They will not know we are Christians by our bumper stickers or our wristbands or our reading lists or our political ideology. They will know we are Christians by the way that we love. And isn’t that a pain in the neck? Because love is hard. Love can be messy. Not long ago a friend of mine, who happens to be a new father, sent me a note. He said, “I just got vomited on. It’s weird how that becomes normal.” But Derrick is grateful for the chance to be puked on…because it means that he is close enough to his infant daughter that she was able to “baptize” him in that fashion. Ask any parent, and they know the truth: love is messy. But we love our children. And we can love each other. We can love each other if we are unwilling to confuse “love” with like-mindedness, or with mushy feelings, or with romance or sexuality. For our purposes, we understand “love” to mean a willingness to relate to each other with the conviction that the other’s interests and well-being are important. Love means telling the truth to each other, and refusing to talk trash about each other. Love means recognizing that we serve the same God, even when we believe different things about that God. Most of you received another card in the mail this week, and I hope that you brought it with you. It asked you to say something about someone in this congregation who has made a difference in your spiritual life. Now, without naming names, I would like to invite a couple of you to please tell us what that person DID that made a difference in your spiritual life? When I saw that card, I thought about the time that a former member of this church called me from another state and arranged for us to meet in order to hold me accountable to an important good. I thought about someone who risked his own credibility because he believed in a crazy idea that I had and he got behind it publicly. You see where I’m going with this, right? That when those people made such a difference in my life or in your life, they were, in fact, loving us. They were acting with our best interests in their hearts and in their actions. Do you know, beloved, how fortunate you are to have people who love you in and through their actions. And do you know, beloved, that in our nation and in our church, that kind of love is in short supply right now? It is so, so easy to speak of “them.” Or, more often, of “those idiots”. You know who I mean – those jerks who are fundamentalist or liberal or socialist or atheist or white or black or fanatics or conservative or Democrat or Buddhist. As if we could lump everything about that person into one viewpoint or trait that we find to be different or disturbing – and then treat that person as though the thing that we find different or disturbing is in fact the most important thing about him or her. I have some friends who are in a church that is trying to leave the Presbyterian Church (USA) right now. That church, and several others, is profoundly upset with some of the decisions that the Presbyterian Church has made (or failed to make) over the years. Good. I am upset with a number of things that the church has done in the past two thousand years. But that fact does not give me the right to go bashing people with whom I disagree, or lying about them, or spreading misinformation. These friends, with whom I disagree and who have wounded me and the Body of Christ, do not deserve my scorn or my anger. I owe them my love. I thought about how hard it is to really love someone who is so “other” not long ago. We had in our community an entire house of what appeared to be parentless children. The street in front of that house was always a shambles. My car was messed with more than once. Things were stolen. It was often loud, and the loudness was not usually the kinds of words that you hope your little children will learn and repeat. And I will confess to you that I was thinking and, yes, praying, about those children. And the thought that entered my mind and thus my prayer was this: “isn’t it time for this group of people to be evicted from my neighborhood and go ruin someone else’s day?” I could not wait for this family to leave. I am ready to throw those kids…or that church…or my political opponents…under the bus, and Jesus seems to expect that I will love them instead. How do you do that? Where does that kind of love come from? Isn’t that true? And don’t you like that phrase – “generosity of spirit”? It seems to me that the love that Jesus expects his followers to share can only come from a spirit that has been blessed with generosity. A spirit that doesn’t really care who gets the credit or the blame; a spirit that would rather work towards solutions than point fingers; that is open to learning new things each day and that is willing to believe the best about someone else. If you are reading along in our devotional booklet Practicing Extravagant Generosity, perhaps you were as struck as I was by the author’s comment on Friday. In it, he describes how we are able to practice generosity of spirit and in our lives because we have been recipients of someone else’s generosity for as long as we’ve lived. Before I was a pastor, I worked with an organization that included among my duties raising my own salary through gifts from other people. Each month, I wrote a letter to friends and family and asked them to contribute to my ministry and thereby enable me to pursue my favorite hobbies, such as making car payments, buying groceries, and the like. This week, my friends, I want to simply remind you of your call to love God. And to demonstrate that love for God in the way that you treat others. Let me invite you to seek out those who have been generous in their love for you, and to thank them for that. And finally, let me encourage you to share that same generous love with others that you will meet in the days to come. You know, for a guy who is not a nurse or a doctor, I spend a lot of time in hospitals. That’s not a bad thing, of course. You’d expect the church, and therefore the pastor, to be present at the edges of life. Lately, you’ve had me in the hospital for a lot of good reasons – reasons named Allison and Hunter and Piper and Kaylee. But sometimes, of course, there are more difficult times to be faced in the hospital. Almost always when I am there, I am fascinated by the monitors. There are lights and tubes and buttons and sounds and screens and indicators…and I take it as a challenge, to be honest, to try to figure out what the machines are telling the medical team about the situation. Of course we can get information without machines. Take your fingers and place them on your wrist or your jugular vein. Can you feel a pulse? Does everyone have one? If not, please check with Margaret or Ginny or one of our other nurses. That could be a problem… What does your pulse indicate? A beating heart. Your pulse is a physical indication that you may be alive. It’s a monitor of sorts. In the next few weeks, we’ll be taking a look at spiritual health. 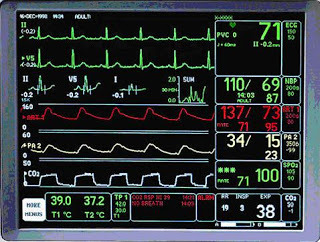 If the lights at the hospital tell us about the oxygen levels in our blood, or how many breaths per minute we’re taking; and if our pulse measures our heart rate; what indicators do we have for spiritual vitality? In our New Testament reading for today, the Apostle Paul gives one way to talk about spiritual health when he points out the power of STUFF to incapacitate or to even kill us. Um, yeah. Well, that’s the wrong answer. Because even while most of us in the room look around and see people far wealthier than we are, with lavish and even decadent lifestyles, the truth is that every one of us in the room is fantastically wealthy by the standards of humanity in 2013. How can I say this? Well, for starters, look at your feet. 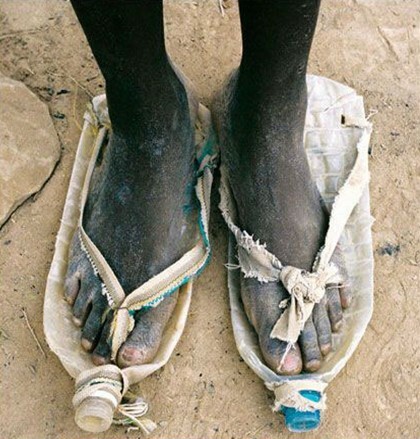 That’s right, you have shoes that fit. You are sitting on chairs. You have running water – hot and cold! – in your home. Many of those homes have “spare” rooms in them. Many of us own and drive cars. Now wait a minute – I know what you’re thinking. When someone trots out that line of reasoning to me, my first response is to say something like, “Well, yeah, but have you seen my car? It’s the ugliest thing on the planet! And what about my friend’s house in Mt. Lebanon! Don’t call me rich until after you’ve been out to Fox Chapel! You have reminded me David of how the hunger was like and how I experienced as a young pastor during that time and how I can help with my Christians. It was really pathetic. I can remember when I was with you at the church, we only managed to sing the first verse of the hymn but later people were not able to finish because of the hunger. When I’m done with this sermon, you’ll stand and you’ll sing – even if it’s one of those irritating six-verse hymns. Because we are, every one of us, fantastically blessed and no one is so hungry that they can’t sing. But as the Apostle points out, often the more we have, the more we worry about getting an even bigger pile of stuff, or about holding on to what we already have. And when my number one goal for the day or week or month or year is getting more or better stuff, then growing in faith in God can be a challenge. Most of you have known of a situation where someone has a physical condition that is indicative of some signs of life, but it’s clear that the kind of living has been changed. When a loved one suffers from the end stages of Alzheimer’s disease, for instance, we might say that even though the heart is beating soundly, the person whom we have loved is not “really living”. The monitors show activity, but the reality is that the caliber of that life has changed dramatically. The same thing can happen to us spiritually as well, and Paul offers a remedy for that: don’t trust in things; trust in God. Don’t pile up stuff; pule up deeds that show the kind of life that we have. If we focus on faith and service, then Paul says that we have what he calls “life indeed”. Not only are we merely existing, but we are living with authenticity and purpose and joy. One of the monitors that we have for the health and vitality of our congregation is the card that you are holding in your hands, or have in your pocket. We mailed them to you a week or so ago, and there are extras in the back. They ask a simple question: What do you love about our church? I’d like to ask you to share what you wrote. What do you love about our church? What did you write? 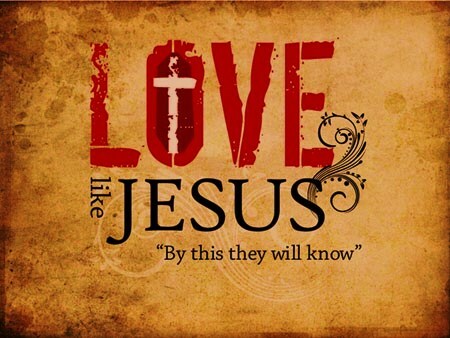 Each of these things that you love is an opportunity for us to see Jesus at work in our midst. Just as an EEG reveals the level of electrical activity in the brain, or the pulse tells us our heart rate, our willingness to be generous with the time, space, love, and money that we’ve been blessed with is an indicator of the presence of Christ in this place. The notion of building nests is often used as a metaphor to describe people successfully providing for their own comforts. If someone arrives at a career position of some ease and security, friends say, “You’ve built yourself quite a nest for yourself here!”… The word nest often connotes shelter, coziness, homelike, comfortable. I found that to be incredibly insightful! God has designed birds so that the things that they accumulate and build are not necessarily for themselves, but for the next generation. One of the things that I love about Crafton Heights is the ways that so many of you live in consideration for those who are not here yet. A number of years ago, you put in an elevator – even when none of you were in wheelchairs. You built a baby room. When nobody was pregnant. Every week, you expect me and Pastor George and Jason and the rest of the staff here to spend an awful lot of time with people who are not members of this church. You are not like everyone else. Do you know this? In the next few weeks, we will continue to celebrate ways in which we see God at work, even as we continue to look for ways in which to grow. You can deepen your participation in this celebration by using the daily devotional guides that are available. Make sure you check your mail in the next few days to see another card – one that I’ll be asking you to return next week. You can start thinking about it now, though – who is someone in this church who has helped you to grow to be more deeply rooted in faith? I look forward to seeing you next week as we come prepared to celebrate the signs of life – life indeed, as the Apostle Paul would say – that we see in our midst. Thanks be to God. Amen.